In our modern world many countries have relatively recent cultural traditions. One of the common threads binding countries together, though, are playing cards, which originated in China around the 9th century CE. Playing cards quickly spread around the world, and in the early 15 century a new kind of card emerged: Tarot decks. Tarot first originated in Italy, with Milan often cited as their origin. Over the course of 600 years, the cards went from commonly used only for entertainment to tools for divinatory purposes. With a history often shrouded in uncertainty, Tarot has managed to become known world-wide, mystifying and enlightening people all over the globe about the occult. While there are several variations of Tarot, the cards usually number 78 and are decorated with often intricate illustrations. Different regions tend to have their own versions, with some decks acting purely as artwork, containing 22 trump cards. 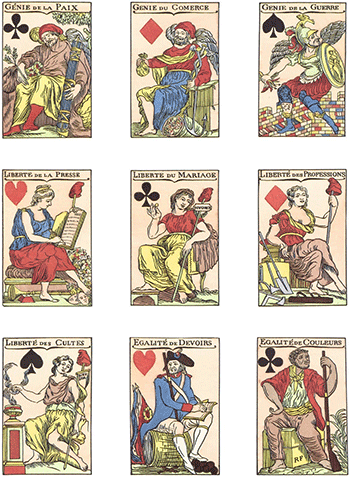 Like traditional playing cards, tarots have four suits, often based off of royal or religious motifs, with ranks including “The Lovers”, “The Hanged Man”, and “Justice”. Occult Tarot decks often include Egyptian symbolism, which many divinists believe comes from Egyptian origins of Tarot. These decks include the Major Arcana, 22 cards without suits, and the Minor Arcana, 56 cards divided into four 14 card suits. The terms Major Arcana and Minor Arcana are reserved exclusively for occult purposes, and aren't used in Tarot games. Usually the suits are based off of classic Italian suits, which are the King, Queen, Knight, and Jack. For purposes of prediction, different combinations and arrangements of cards provide further nuance to Tarot. Playing cards first entered Europe through Egypt in the 14th century, and Tarot cards followed soon after. The first recorded tarot card decks created in Europe were produced in Italy in 1430 and 1450. Tarot cards took on their characteristic trump cards when cards containing allegorical pictures were included with traditional suit packs. Martiano da Tortana makes the first mention of the packs, painted by an artist named Michelino da Besozzo. The decks came with pictures of Greek gods and bird based suits. As the Tarot cards caught on, special themes around cultural and political influences came into production. Hand painted Tarot sets were popular among the upper class, and many surviving decks come from the collections of royal families. It is during the 1400's the oldest surviving Tarot cards, painted for the rulers of Milan, were produced. Only a few decks were produced at this point, when the printing press had yet to be invented in Europe. Tarot games diversified in their rule set during this era, possibly due to their widespread, sporadic availability. Divination first appears with playing cards in the 1540 book, The Oracles of Francesco Marcolino da Forli, with the cards used to select oracles for divination. In the 1735 manuscript The Square of Sevens, early divinatory definitions for tarot cards were described alongside a basic card layout. These early occult traditions didn't gain much popularity until the 18th and 19th centuries. Antoine Court de Gebelin, a pastor in Switzerland, studied religious symbolism he saw in Tarot as representing Isis and Thoth. He asserted in a 1781 piece that, given the cards Egyptian origin, that tarot cards were meant to provide a path to wisdom. While later studies of Egypt showed Antoine Court de Gebelin had several errors in his analysis, his writings sparked the connection between occult Tarot and Egypt. The idea of Tarot as occult soon spread. Shortly after de Gebelin, his work was picked up by Etteilla, whose real name was Jean-Baptiste Alliette. He was the first to create a Tarot cartomancy society, and tried to fix perceived corruptions of Tarot decks through his invention of the Grand Ettielle deck. He also tried to explore, through a piece called Dictionnaire synonimique du Livere de Thot, the possible meanings of different card combinations and orientations. His claims included the first Tarot was made out of gold leafs. Tarot cartomancy caught on with famous figures like Napolean Bonapart through Mlle Marie-Anne Adelaide Lenormand, who had her own deck, the Grand Jeu de Mlle Lenormand created for her posthumously. Eliphas Levi, also known as Alphonse Louise Constance, a student of religion, claimed that he discovered great secrets within tarot. He saw an Astral light contained within all reality, and saw Tarot as a connection to ancient magic. Levi believed that Tarot was at the center of Cabbalistic mysteries, and rejected ancient Egyptian origins for Tarot, instead believing Tarot de Marseille was based off of a text he called The Book of Hermes. The 1850s saw the propagation of several types of Tarot decks, fueled by the foundation of the Rosy Cross Order, which revitalized beliefs in the occult. For the first time in modern history, Tarot became associated with ritualistic initiation. The Tarot cards were now interpreted in an 1889 essay to be linked to spiritual development. Le Tarot des Bohemiens, written by Papus (a pseudonym for Gerard Anaclet Vincent Encausse), a French physican and occult figure, was the first serious attempt to interpret the wisdom of Tarot and its connection to the Sacred Doctrine of human spiritual history. Since the late 1800s, Tarot has become popular all over the world. While still played as a game, in most English speaking countries Tarot is primarily associated with the occult. Some systems take Tarot cards less literally as tools of divination, and focus on using them as a symbol system for personal development. While certain Christian groups have fingered Tarot cards as an invention of the devil, this myth stems from earlier European clergymen who tried to ban cards used for gambling, not divination. In conclusion, despite sometimes disputed origins, Tarot is here to stay as a tool of divination and philosophy, as well as for entertainment. While Tarot is over 600 years old, the decks allegorical and often hand-painted decorations lend themselves to continual customization, helping them remain popular. Tarot's assimilation into numerous cultures means millions world-wide are helping to keep this spiritual tradition alive, and those millions of people assure Tarot will continue to diversify, providing insight for generations to come. What Is A Cartomancy Reading? The History Of A Psychic’s Amazing Crystal Ball! I’ve recently began avianilg of the free tarot readings online, and most of the time the readings are quite accurate. I heard that the cards pick up on the questioner’s energy, but i’m quite amazed that even if the cards aren’t physically in front of you, only pics of it that can be seen via the pc screen, and it can still pick up your energy. Although when i was in the parking lot or when i was talking to my friend on the phone, it was more of like guess if the reading is for you or for another person since i get results that i can’t relate to and it turns out it’s directed to my friend. How is that possible that those cards seem to read our mind even if it’s just in front of a pc?I used to dismiss tarot card readings before, but ever since i came across mysticgames.com, my opinion has changed. Try to do the path spread there and you guys see for yourself if the reading is right on target for you or not.